Of the sun, moon and stars! Your hands, the motion of simple divinity. Beckoning the night into chaos! The one and only Jack Micheline! 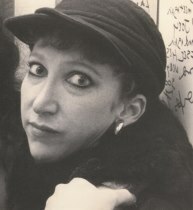 Joie Cook was a performance artist par excellence and a well-known firebrand of San Francisco's poetry haunts. Joie Cook's work has also been published in the book New American Underground Poetry Vol. 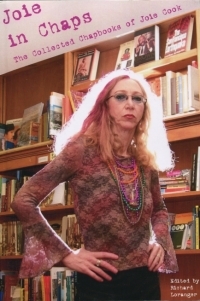 1: The Babarians of San Francisco-Poets from Hell of which she was a celebrated member. Joie Cook's first full-length book of poetry. glimpses of the essential grace and gentleness of her soul.” ... Vince Storti,artist, poet and editor of 'The North Coast Review' (from the Introduction). 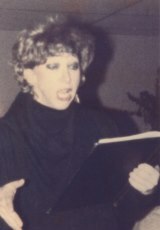 Joie's books and performances are legendary in San Francisco, though her habitat has included New York, New Orleans, Baltimore, Provincetown, San Diego, Portland and Seattle. 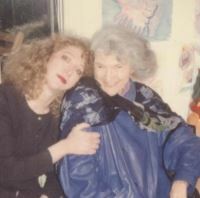 Especially beloved in bohemian poetry communities in North Beach and the Mission district of San Francisco, Joie Cook was the first featured poet inaugurating the infamous Cafe Babar series of the 1980s. Her work is widely appreciated and admired. ....Zeitgeist Press. Why do I come to your poetry readings? Because I like the way you handle pain, baby. You spit in its eye. Sometimes you go off dancing, anyway. If I could, I would LIVE outdoors!" The is my natural contribution. Strings strummed amongst the evergreens. Joie Cook and her beloved husband David Picariello.